Jindal (India) Limited has state of art coating facilities to meet all requirements of client. The coating plant is capable of applying multi-layer coating that comprises Fusion Bonded Epoxy (FBE), Co-polymer Adhesive and High/Medium/Low density Polyethylene/Polypropylene. 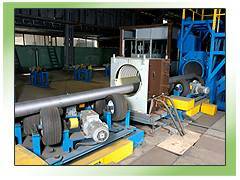 This is in addition to applying a single layer of FBE on the external surface of steel pipes if required.The coating plant has a capacity of coating pipes at the rate of 300sq meter per hour. The best corrosion control system for underground pipe lines lies in its ability to limit oxygen and water transport to the pipe surface and compatibility with cathodic protection (CP) system. 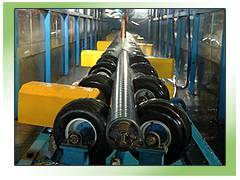 The coating on line pipe with FBE and PE are designed such that it will work in compatible with CP system and not interfere with it. The applied coatings at Jindal (India) Limited exceeds the quality requirement s of DIN 30670, CSA Z 245.20, CSA Z 245.21 and its equivalent. All activities of the coating plant are controlled through rigorous quality assurance system that meets or exceeds ISO: 9001-2008 requirements.